Enjoy Driscoll’s berries almost all year-round, thanks to our wide network of Australian and New Zealand growers. From all the way down in Tasmania, up to Far North Queensland, and across to the south-west of WA, you’ll find Driscoll’s growers carefully tending their crops of our beautiful berries at different times of the year. Our independent growers are located all over Australia and Waikato, NZ to ensure that we can supply you with fresh berries almost all year round. For example, when it’s frostily cold down south in winter, we’re harvesting raspberries and blueberries in northern NSW and Queensland and distributing them to supermarkets around the country. 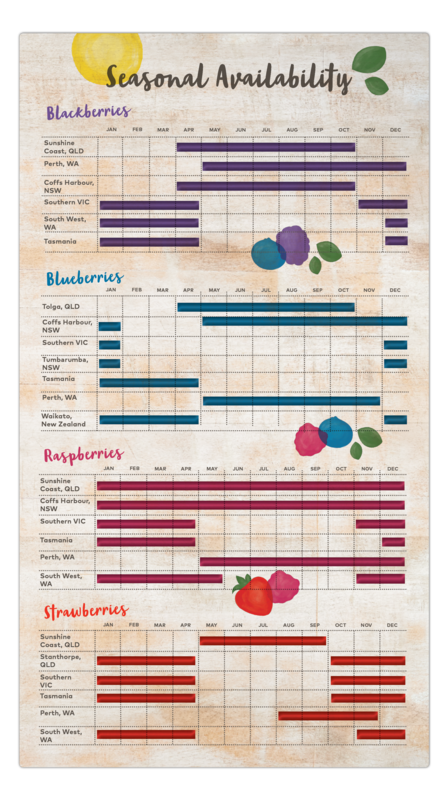 Driscoll’s goal is to supply fresh berries all year round, and we’re working hard to achieve this.